On 1 August a new international social media advocacy campaign was launched on Twitter called #52playsbywomen. It is a campaign for the theatre, inspired by Women In Film’s successful #52filmsbywomen campaign. Started by American writer Laura Annawyn Shamas, #52playsbywomen’s goals are to foster further recognition of plays by women on social media, and to encourage the repeated selection of plays by women as a personal choice for theatre-goers around the world. In terms of produced plays, women writers only constitute about 22 per cent (or less) of those seen on global stages. So the idea is that #52playsbywomen will nurture and support an individual’s development of a theatre-going “habit” of seeing plays by women, and help to support more productions of plays by women. And if no play by a woman playwright is available for example no performed plays in a specific region, you can still join in: promote reading a play by a woman as another option for showing support. 1. Pledge to see a play by a woman (including woman-identified) playwright each week for a year. 2. 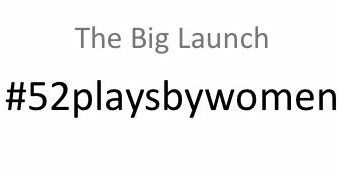 Then you post a tweet each week saying 1. the playwright’s name, 2. the play’s title, and 3. the hashtag #52playsbywomen. 3. Do this for one year. If there are not that many plays by women being produced in your area, but you would still like to participate, public readings and/or workshops of plays by women count, as does a reading of a published play (or a script) by a woman playwright. A public reading and/or workshop of a play by a woman playwright counts because it’s a performance. And if you cannot attend any public performance of a play by a woman playwright because there are no productions or readings in your area, you could, by way of substitution, read a play by a woman that week and post that play information instead, by adding this hashtag #readaplay to the #52playsbywomen hashtag. If you are a female playwright and would like to promote your own play that is currently in production, this hashtag is not a good place to do that. If you would like to have your own play promoted on this hashtag, please encourage audience members who have seen your play to post about it, please do not do so yourself. Encouraging your audience to join in benefits you more as a playwright as others will be discussing your work AND they will be developing a theatre-going habit of seeing plays by female playwrights. Short and ten-minute plays by women playwrights count – anything that runs ten minutes or longer. If you have any other questions just post them to the #52playsbywomen hashtag on Twitter. The launch of this initiative has been supported by Niall Tangney on his Theatre in Sydney and NSW site; The League of Professional Theatre Women: check it out on: LPTW Social Media Advocacy; The Los Angeles Female Playwrights Initiative; Equity in Theatre, Canada and 17Percent, UK. 17percent’s showcases give women a voice and the opportunity to share stories from a female perspective, and show positive role models onstage to both women and men. This is important because if all stories are about men and told by men, we keep seeing the same story; we get used to a dominant male view. Why 17 percent? It’s a significant figure; it was quoted at Sphinx theatre’s 2009 ‘Vamps, Vixens and feminists’ conference as the percentage of UK women playwrights being produced. When only 17 per cent of UK produced plays are written by women, when women make up 52 per cent of the UK’s population, and 65 per cent of the theatre audience, something is badly skewed. The Kilroys ran a survey and came up with these 53; Susan Jonas, a dramaturg, playwright, producer and teacher who is currently editing a textbook for a survey course on female playwrights over 10 centuries has put out this list; Kathy Perkin and Roberta Uno put together an anthology of Contemporary Plays by Women of Color; and Wikipedia has a list of early-modern women playwrights from the UK.